Frume Sarah has been accused of many things over the years; being flexible is not one of them. I like what I like. I do what I do. I like what I do and change is not one of the things I either like or do. Kitniyot. That’s what I’m talkin’ about. Let’s take one step back and define chametz as understood by the rabbis. There are only five grains that according to Jewish law, can ferment and become chametz. These are wheat, barley, spelt, oats, and rye. [Times have certainly changed. When I was young, I can’t imagine where one might have found spelt. Today, spelt bread can be found in my neighbourhood Trader Joe’s.] It so happens that matzah can only be made using one of these five grains. Traditional Jewish law forbids eating, owning, or deriving benefit from these five grains in any amount and in any form throughout the holiday — with the obvious exception being when they are used to make matzah. About seven hundred years ago, Ashkenazic practice began to forbid the consumption of rice, millet (I had no idea either. I had to look up millet. 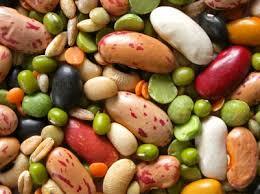 ), and legumes (e.g. peas, beans, alfalfa, lentils, carob, soy, and peanuts). Corn was added to the verboten list at some point. These foodstuffs were termed kitniyot. Even before this practice, there were Talmudic discussions about the status of rice and millet, with a notable amount of disagreement. More on the kitniyot conundrum here and here and here and here, with one of the best articles located here. Having spent hours and hours reading about kitniyot, one thing is clear; Jews of all levels of observance are wrestling with this issue. I am conflicted. I didn’t used to be conflicted. That’s not to say I enjoyed abstaining from kitniyot or even that I agreed with the prohibition. I felt strongly, however, about upholding the culinary traditions that have been in my family for generations. But life is more complicated when it’s touched by Asperger’s. Everything is affected by it. Eating habits are especially affected by it. And I am wondering if it is really worth it to engage in a practice that was described by several Rishonim, such as Rabbenu Yeruham (Beit Yosef OH 453), as “foolish.” Beernut is already complaining that he hates Pesach. And before you go pointing fingers, I have been extremely guarded about my own feeling about this chag in front of my children. So, my dear readers, I ask you — shall I break with family custom in order to make a more enjoyable experience for my son? ← Is it…or Isn’t it?? I’m curious about the connection between Asperger’s and diet. Anyway, good luck whatever you decide. Though there are some who believe that there is a connection between Asperger’s and diet (gluten and casein-free), this has more to do with the rigidity that goes along with spectrum kids. Beernut simply lacks the ability to be flexible. It is something which we struggle and are always working to help him with this issue. However, eating is an area of tremendous stress and difficulty for him. My only Sephardic relatives are via marriage. So I can’t lay claim that way…. For the wife (sorry, going to be gender-specific here for a minute), there is the option to follow the husband’s tradition. I’m sephardic and my wife is ashkenaz, but we follow the sephardic tradition as a family. I have been following Sephardic tradition since learning about it in college, both because of some Sephardic ancestry and because of text study that led me to conclude that the kitniyot prohibitions made little sense to me in todays world. To the issue you raise, as the father of a child with special needs that at one time were thought to be on the spectrum, I have become a big proponent of seeking ways to make the world fit him as often as he needs to adjust to the way the rest of the world sees things. My answer, bring on the rice and beans! Have a happy, healthy, and easier Pesach! Thanks so much for sharing your own experience, David. It’s reassuring to hear from other parents who understand some of the struggles we are facing. Abstaining from Kitniyot is a minhag, not a mitzvah. I’m actually astonished by the number of people who do not observe some of the biggest mitzvot from the Torah (let’s start with the “big 3”- shabbat, kashrut, and taharat mishpachah) but are sticklers about not eating, say, green beans. I ate kitniyiot when I was a vegetarian, and still will eat them. I think if you have any compelling reason, and you are flexible in your practice about any mitzvot, then kal v’homer, you should feel fine eating or serving kitnityot. I had never really thought about it from this perspective. If you think Beernut’s health will be affect (even just a little), then I think he should be forbidden from abstaining from kitniyot. For the past 4 years I have either been pregnant or breast feeding for Yom Kippur and have been told that I was forbidden from fasting. And that is just ONE day. You’re talking about 7-8 days of “fasting” for Beernut. He is at an age where good nutrition is key. He needs carbohydrates to make glucose for proper brain function at school, he needs energy, and he needs to continue to grow. I would suggest that until Beernut’s taste for different food expands, or until he his over 18 years old (when growth and development, for the most part, slows significantly), he SHOULD be excused from abstaining from kitniyot. These family customs were not developed to put your child’s well-being in danger. They were designed to remind you of Jewish liberation from slavery. Good luck. I appreciate you sharing this. I don’t think his overall physical health will be affected by this one week. I do, however, think that his mental health will. His negative disposition towards Pesach is definitely due to the stringent eating restrictions we have always observed. As far as he is concerned, they are a reminder of the slavery and NOT of the liberation. Especially for kids, and even more so for kids with different needs – I try to make Pesach more about what we CAN have instead of what we can’t. Cake for breakfast, sugar “cereals” (the only fake chametz that I buy during Pesach, actually), chocolate spread on everything….it’s not the healthiest week in our lives, but I make sure they drink a lot of water, eat a lot of apples, and are generally as happy as can be. The point is to celebrate, not fight. I am really struggling with this right now. Shayla is planning on observing this year, but I don’t know what our traditions and our guidelines should be. I was ok with avoiding all of the items for the week, chametz and kitniyot, but as I was doing my own research on what all was included in those categories I discovered a lot the same info. you did. So now I’m very torn on what we should do. I don’t have the family history of avoiding kitniyot, so maybe we stick with just chametz. Which means it’s ok to eat rice and corn during Passover, that would feel odd. It also would make Passover much easier, which is good, but then isn’t is supposed to be hard. I was much more concerned with avoiding rice, nuts, beans and corn, which is why I started my research. So do we simplify and just avoid chametz? I don’t know what we should do. I feel like this is the year I have to decide since it’s the first year that she will be observing with me. Chalk me up as another “yes” vote. Sara said it best above, but Homeshuling brings up the point about it being minhag in any case. (although I have found the counter-argument during our kosher journey to be “minhag becomes halacha”. So much for minhag being a de-facto “do what works for you” card. But I digress). Do what you can (what it takes) to help Beernut love love LOVE the Passover season. Make it so good he starts getting excited for it weeks (or months) ahead of time – food and all. If you do that, he will be a connected Jewish adult and that (in my humble, non-Rabbinic opinion) is worth more than a bushel of corn. PS: Our dilemma, being Sephardic, is how to allow our indulgence of kitniyot in other products – mostly this comes down to stuff with corn syrup. Since almost nothing is marked “Kosher for Passover with Kitniyot”, we just have to make our best possible guess. The kosher frozen vegetables are PROBABLY fine. The potato chips, probably not. But my point is don’t let the kitniyot IN other stuff slow you down too much either. frume sarah, conflicted indeed! long standing traditions feel like natural must-dos for us. but as we try to pass on these traditions to our children we have to work hard to make our kids see and feel that they are a part of these same holidays and traditions and that they are indeed, for them. having taught children within the autism spectrum i know that when something of comfort and love is found, it should be kept. and in my opinion, that includes food. even at passover. Your latest blog entry shows clearly how being a Reform Jew is not the easy way out” if one is serious about it. While I am emotionally inclined to maintain the Ashkenazic practice, a strong logical case for abandoning it is presented in the articles you cited. We are not Halachic Jews. For example, we observe Pesach for 7 days even though the Halachic authorities established Yom Tov Sheni shel Galuyot. When push comes to shove, we should see a difference between eating, during Pesach, a peanut butter sandwich on wheat bread and a peanut butter sandwich on matzah. One is the baby; the other is the bath water. B’hatzlacha as you work this one through! Pandora (aka “Mrs. Edible Torah”) also wondered if it was possible to create a “kitniyot corner” for Beernut. A place where you could stash the items he will need for the week but which can still be psychologically separate and segregated for Mom (ie: you) as well as not being a temptation for the rest of Chez Frume. You will obviously need to make a few concessions about the cooking space – whether or not the microwave, toaster oven and cooktop are in bounds or out of bounds. But if you just need a way to provide Beernut with simple kid food, it probably doesn’t need much in the way of prep anyway. Anyway, that’s another thought from someone who is a million times wiser (and prettier) than myself. actually, according to traditional halacha, kitniyot can be cooked on kosher for passover utensils. at least that’s what i learned in yeshiva. I don’t think as many people are dropping it as the article below indicates, but a bunch of people said to me that are thinking about it. I hope you are all enjoying the holiday.